Israeli Prime Minister Benjamin Netanyahu asked International Committee of the Red Cross (ICRC) to help bring back Israeli civilians held in Gaza. He made the request in his meeting with ICRC President Peter Maurer in Jerusalem on Wednesday. 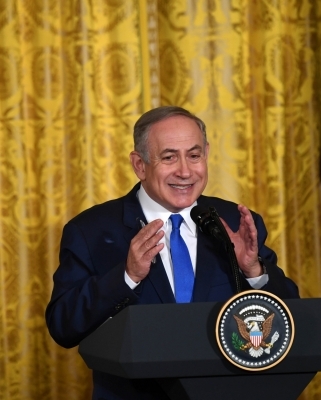 Netanyahu said Israel has been seeking information about two civilians, who voluntarily crossed into the Gaza Strip and are believed to be held captive by Hamas, the Islamist organisation that controls the coastal enclave, Xinhua news agency reported. Hamas, however, refused to divulge any information, he added. “You come at a time when Israel is concerned about the unbelievable cruelty as the bodies of its slain soldiers are kept, and even information about them is kept,” Netanyahu told Maurer, according to a statement released by the Prime Minister’s Office. “No less important, innocent, defenceless civilians are being held in Gaza,” he said. The ICRC president added that he was looking forward to having “the opportunity to look into some of the challenges that everyone is currently confronted with and to see how the ICRC can eventually help with them”. Two Israeli civilians, identified as Avera Mengistu and Hisham al-Sayed, entered Gaza in 2014. Israel believes they have been held captive by Hamas since then. Hamas has never officially acknowledged if the two Israelis are in the besieged Palestinian enclave.